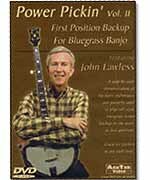 Over 650 bluegrass, blues, and jazz licks in Scruggs, single-string, and melodic styles. Learn to use licks to create solos, play back-up, expand your musical knowledge and understanding of the fingerboard. 144 pages.